A few weeks ago, I missed participating in Johanna's Nut roast Challenge. Not everyone likes nut roasts and that includes vegetarians. 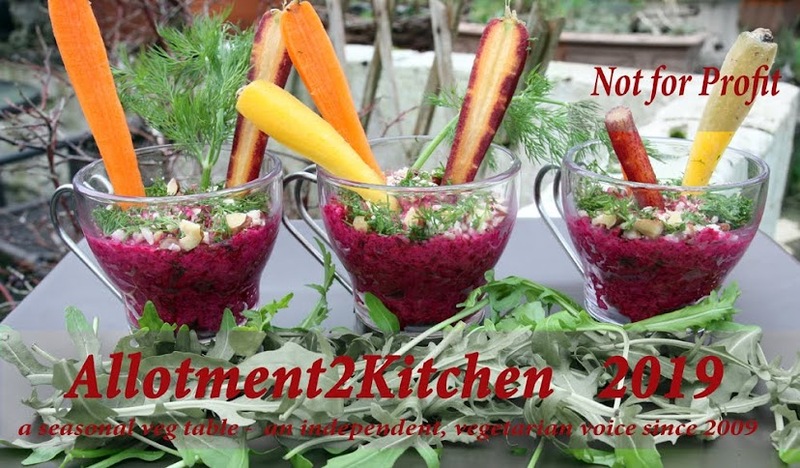 Its seen as old fashioned and a throwback to 1960s-70s vegetarian cuisine, but I actually think they do still have a place in in this day and age. 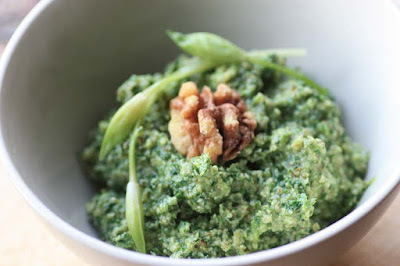 Anyway, this month Johanna is also hosting the Breakfast Club event #11 on her blog Green Gourmet Giraffe. The Breakfast Club was initiated by Helen of Fuss Free Flavours. 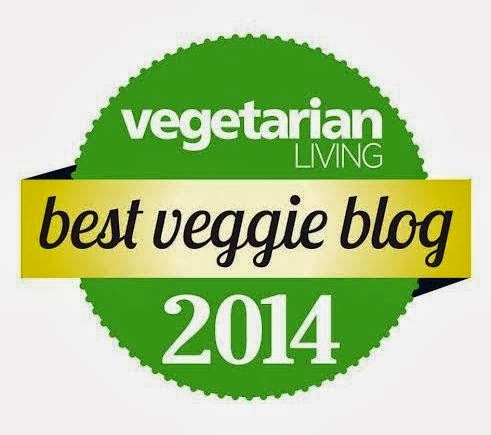 The challenge for May is to create a savoury and vegetarian breakfast. Well as some of you may know, I often indulge in a proper cooked vegetarian breakfast, especially at weekends. For me this can be a veggie fry up or waffles galore. This time though, I thought I’d go one better and make it all vegan. 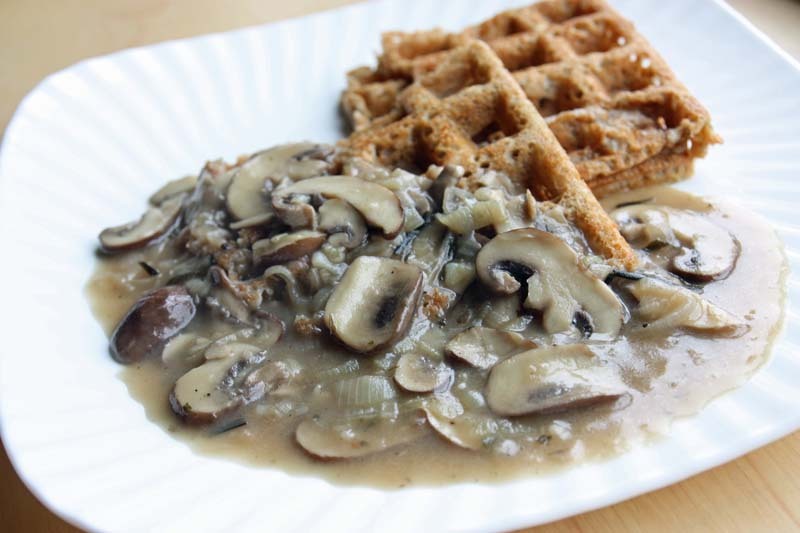 My chosen recipe was Buckwheat waffles with a mushroom gravy sauce. Another excuse for making these buckwheat waffles was my rather large packet of Black Buckwheat flour. The 'Noir' or black in the buckwheat simply means it contains the hull which makes the flour look darker - Just imagine wholemeal flour, well I guess this is Wholemeal Buckwheat flour. 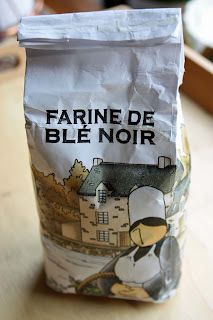 I picked up the flour whilst on holiday in Brittany last year, land of galettes and savoury crêpes and its still unopened. I don't know about you, but I have a really bad habit of not using ingredients (sometimes expensive ingredients) and keep them stored well; as if they are an antique of sorts that will gain value if left unopened. Obviously this is not the case, as they go past expiry date and end up down the sink or in the bin. In my store cupboard I also have Carob Syrup from Cyprus, Violet Syrup from France, Tiger Nuts when I was in Whitby, Welsh Laverbread from my nephew, Irish Carragheen, Carob flakes, Liquid Smoke, White Poppy Seeds, Barley flour, Sorghum flour, Chestnut flour, the list goes on. Back to the recipe. This was my first ever vegan waffle attempt, though cooked through, I had to prise the waffles out from the waffle iron. The mixture was a little thinner than the eggy versions. Also when cooked, the waffles didn't look like its eggy counterparts that are puffy and airy. I also noted that the waffles had lots of air pockets. I wondered if this was because of the black buckwheat flour and the result may have been lighter had it been just plain buckwheat flour. This did not affect the taste though which was nutty. There was also a sweetness that I am guessing was coming from the soya milk. The Mushroom Sauce was especially nice, and one I can see being ladled over some new potatoes and green vegetables like Brussels sprouts. Measure out the milk and water and add the vinegar to it. Set aside to curdle. In a large mixing bowl, mix together buckwheat, flour, baking powder, salt and sugar. Make a well in the centre and add the milk mixture and oil. Mix together until relatively smooth. Let the batter rest for minutes. Meanwhile make the Tarragon Mushroom gravy and preheat the waffle iron. Heat a large pan over medium heat and saute the shallots in oil until soft, then add the garlic and cook for a couple of minutes. Stir in the mushrooms, tarragon and season to taste. Cook on medium heat until the mushrooms begin to soften. In a measuring jug, measure out the vegetable stock and stir in the flour ensuring that there are no lumps. Then pour the stock into the shallot-mushroom mixture and gently simmer for 8 – 10 minutes or until the mixture becomes gravy like – thick and creamy. Whilst the mixture it transforming into a thick gravy, make the waffles according to your waffle mixture. Then plate up and gently ladle each plate with the mushroom gravy. Adapted from Vegan Brunch by Isa Chandra Moskowitz. This sounds great! I'm usually in such a rush or too hungry in the mornings to put much effort in, but this would be worth it. I'm the same way about buying random ingredients with no plans to use it - worse, I'm that way about kitchen utensils so I own a waffle maker but have used it only once or twice. I would bet with more baking powder the waffles would rise - its probably just because buckwheat flour is so heavy, but it's so good! 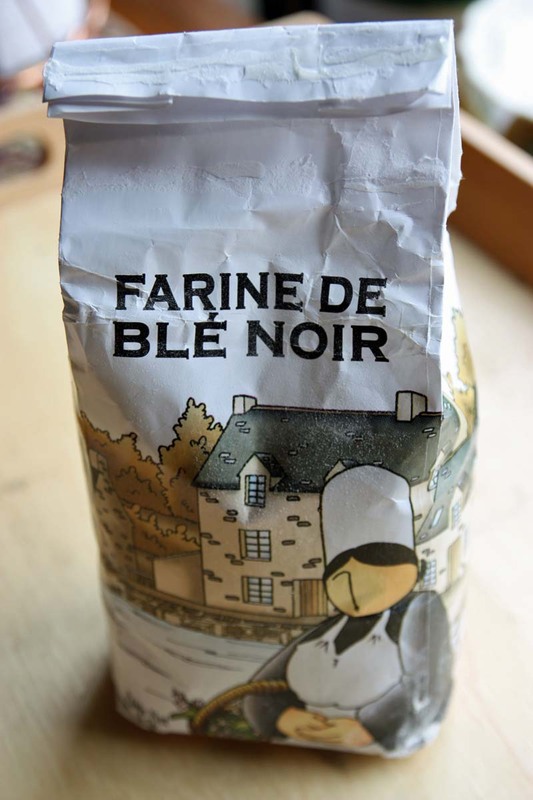 Wow, black buckwheat flour! SO cool!! These waffles look gorgeous - I so adore savory waffles! I'm looking forward to seeing the other savoury entries. Buckwheat is still new to me. Of course I had it in France as savoury crepes, but I haden't really cooked or baked with it until today, so am looking forward to making other dishes with it. purchase too many deli type ingredients. PS Yes, the second comment was missing. Oh please don't get me wrong, when I was busy working (paid employemnt) I had time only for a coffee and toast, these cooked breakfasts only happened at weekends. Its good to read that too buy random ingredients - I feel normal :) Quite amused that your that way about kitchen utensils. I think I may have been too, had I room. I think your right the black buckwheat flour was heavier than the traditional version, plus baking powder may have made the waffles rise. I can only try again! 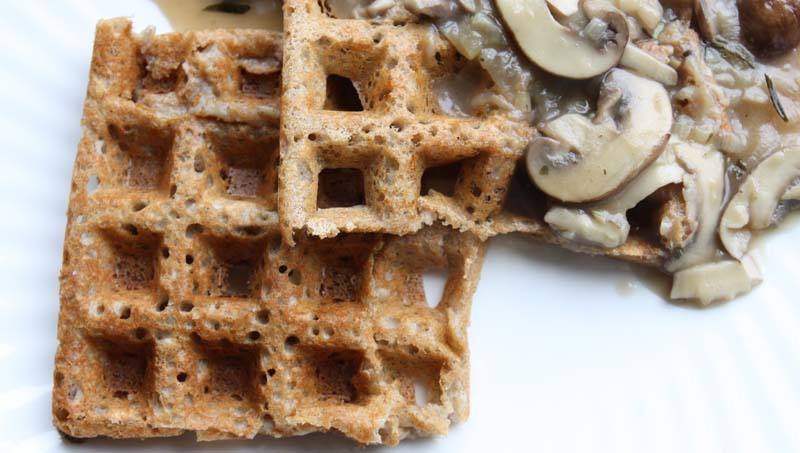 The savoury flavour of the black buckwheat waffles was lovely, I just wish they had risen a little more. 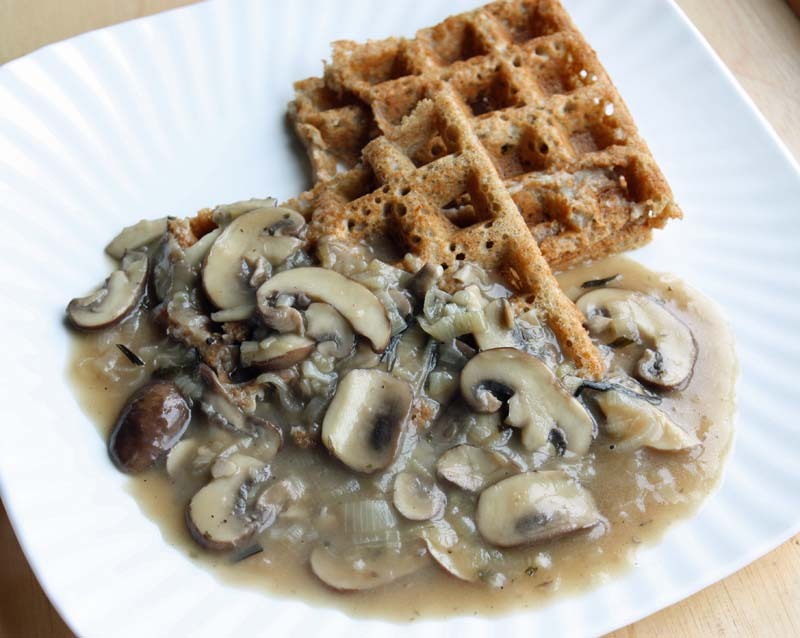 I never would've imagined pairing waffles and mushroom gravy in a savory dish. This looks great! This combination really works, and its soooo flavourful. This sounds delicious! I have never eaten a savory waffle - only the sweet version. Oh, the possibilities! In the past I've also made potato waffles. Its always good to hear from you. How delicious! they look amazing and something that I need to try, especially as I have some buckwheat in the cupboard. Many thanks for taking part in Breakfast Club! Maybe someone should start an event about buckwheat :) (would also help you to use up the rest of your buckwheat flour *hehe*). Since this is my new passion I'm very grateful for your nice recipe. Perhaps - it would certainly help as its gone back in the cupboards without another thought. No I didn't find the slight sweetness unpleasant, it was just a little unexpected. My husband suffers from arthritis and has given up cows milk for soy milk in his tea (he does drink tons of the stuff), but he still eats likes his cheese and yogurt (which are enjoyed in much smaller portions). I hope you try these savoury buckwhat waffles. I also hope it works out better for you than it did for me, and moreso hope you and C enjoy!